Newcomer Family Obituaries - Robert C. 'Bob' Oswalt, Jr. 1948 - 2018 - Newcomer Cremations, Funerals & Receptions. Robert C. "Bob" Oswalt, Jr.
Robert C. Oswalt, Jr. age 69, of Toledo, passed away unexpectedly August 2, 2018 at his home. He was born August 23, 1948 in Toledo to Robert and Esther (Peacock) Oswalt. Bob was employed with Local 886 for over 50 years, most recently as a cement mason. He enjoyed old cars, motorcycles and NASCAR, but most importantly spending time with his family. Bob is survived by his wife, Dot Oswalt; father, Robert C. Oswalt, Sr.; children, Robert (Lisa) Lee Oswalt, Todd (Jennifer) Oswalt, Mark Oswalt, John (Helena) Carman, Jr. and Kelly Carman; 10 grandchildren; 12 great-grandchildren; and sister, Nancy (Daryl) Gruber. Bob was preceded in death by his mother, Esther Oswalt. Per Bob’s request, there will be no services. Add your memories to the guest book of Robert Oswalt, Jr..
A great picture of my Brother-in-Law taken from us way too soon. RIP Bob. 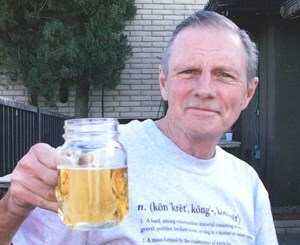 Definitely the way we want to remember him with that great smile on his face and a cold beer! RIH Bob. We are here for you Dot with much Love, tons of hugs and prayers or whatever you need! I am so sorry to hear of Bob’s passing. My sincere condolences & prayers are with you & your family. So sorry Dot prayers for you and family???? I am so sorry to hear of Bob's passing. Prayers for you and your family. Our condolences to the entire Oswalt family. We'll always remember the fun times. You will be missed by all who loved you! Much love, your sis, Nancy. Sending hugs to you, Dot. Dot, Jim and I are so sorry to hear of your loss. Prayers to you and your family. Craig and I are so sorry to hear of Bobs passing. May he forever be at peace. Enjoying a cold beer. Great picture that’s the way I want to remember him, he was a great guy.